The Coconut Company`s pure, dairy and gluten-free premium coconut milk powder is GMO-free and produced from freshly-squeezed coconut milk. 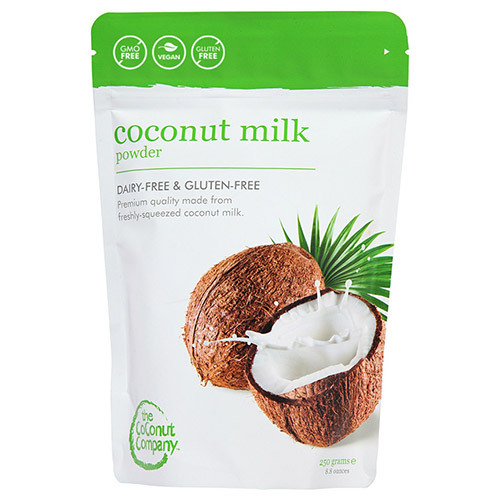 This wonderful coconut milk powder contains approximately 65% coconut oil content that retains many of the health benefits of the raw coconut. It has a superb natural aroma. The Coconut Company is all about coconuts. Natural healthy living is at the heart of what they do. They work very closely with their farmer cooperatives and food processors to ensure products are of the very best quality. Raw, natural and organic. Coconut milk, maltodextrin, corn starch from non-GMO sources. Convenient alternative to canned coconut milk. Use on breakfast cereals, in coffee, smoothies, milkshakes, yoghurt and ice creams and as an excellent flavouring to curries, vegetable dishes and exotic sauces. Also a good thickening agent for cakes, biscuits and desserts. Just mix 1 to 2 tablespoons in a cup of warm water and stir well to produce rich instant coconut milk or cream. Reseal bag tightly after use. Below are reviews of The Coconut Company Coconut Milk Powder - 250g by bodykind customers. If you have tried this product we'd love to hear what you think so please leave a review. Love this product and use it daily in a smoothie, plus good in curries.